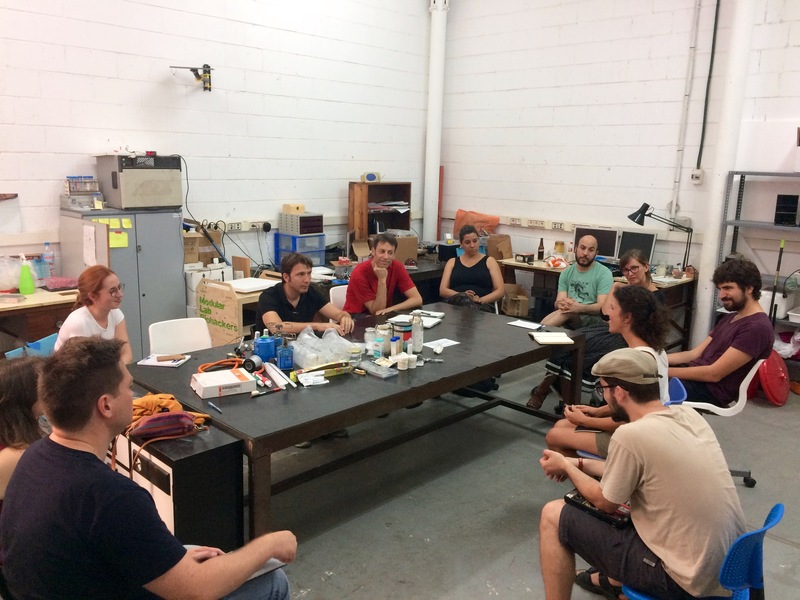 I would like to start my DIY science series of articles with a recent DIY bio activity at my local community lab, DIYbio Barcelona. Bacterio-phage means “bacteria eater” and this is the name we give to viruses that infect and kill bacteria. When I saw the announcement for a bacteriophage workshop at DIYbio Barcelona, I knew I couldn´t miss the opportunity. 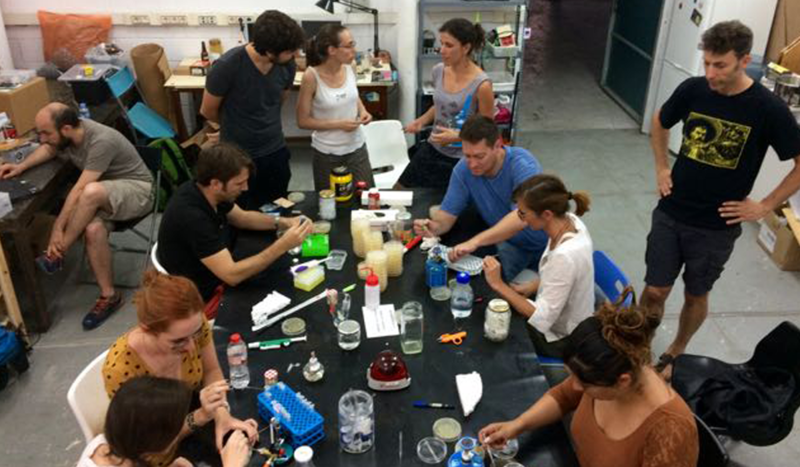 The PhageFreeLab team will give a 4-day workshop where we will learn how to make bacterial cultures, how to inoculate bacteriophages, how to count the cells, separate them, and how to extract and filter them in order to obtain a ready-to-use solution”. Introductions, who we are and what brought us here. Each participant had a different motivation to join the workshop: "I wanted to be a biologist but my teacher told me to study something else since I would never get a job as a biologist"; "I am a computer scientist, so I am looking forward to doing science using tools other than a computer"; "I am a pharmacist and we don´t make recipes anymore, so I love to join hands on science activities"; "I am a translator of scientific content and want to practice some of the things I translate about". 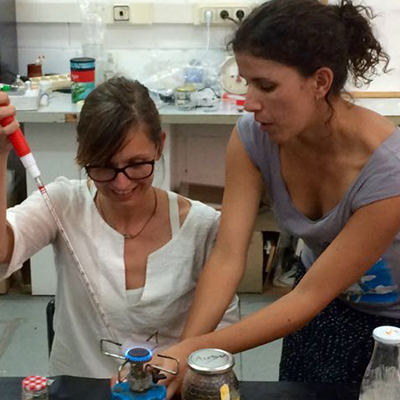 The reason why I couldn´t miss this workshop is that I wanted to work again with phages. When I was a scientist in training, I used bacteriophages in my research project. I was studying blood vessel formation in tumors to find a cure for cancer by limiting the blood supply to the tumors. To be successful we needed to destroy only the blood vessels in tumors and my goal was to identify antibodies that were specific to tumor vessels. Those antibodies would bind only to the tumor blood vessels and would be good candidates to develop therapies. At the time, a new technique called “Phage Display Technology” had been developed. It used bacteriophages (phages) as a tool. With this technology, we could replicate the human immune system in a test tube. To do that we took the genes that coded for human antibodies out of B cells and inserted them into bacteria. When we infected these bacteria with bacteriophages, the newly produced phages had one of those human antibodies displayed on their surface. Since we used millions of phages, we also had millions of different antibodies displayed on them. This technology allowed me to select the antibodies that bound only to blood vessels present in tumors. 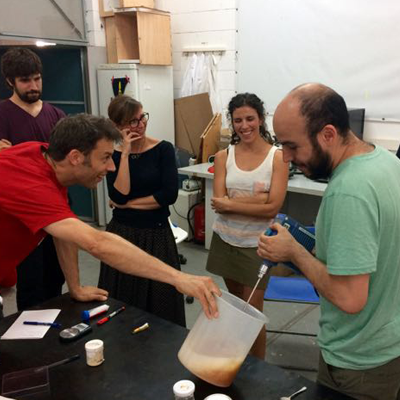 Many years after my last experiment using bacteriophages, and thanks to DIY bio, I had again the opportunity to work with phages, but in a different way and with a different purpose. In nature, we can most certainly find at least one kind of bacteriophage for each bacteria species. Phages reproduce by injecting their genetic material into bacteria and using the machinery inside the bacterial cell to produce new phages. The progeny then bursts the bacteria and searches for new bacteria to infect. We know a lot and very little about bacteriophages. In 1977 the phage ϕX174 was the first organism to have its entire genetic sequence determined. Today we are able to use phage as tools in recombinant DNA technology, as I have described. However, we know very little about the biodiversity of phages and their potential use as agents against bacterial infections. Bacteriophages have many advantages over antibiotics. Unlike antibiotics phages are easy and cheap to produce, they make more of themselves as they infect and destroy bacteria, and they are highly specific against one, or a few, bacteria species. This last feature is very advantageous in treatment since only the bacteria causing the infection are destroyed; leaving unharmed all other “good” bacteria. However, this also means that we first need to identify the bacteria causing the infection in order to find and use the specific phage that kills it. That is actually what Clara Torres-Barceló and Geronimo Diese, the scientists running the workshop, do. Geronimo has a Ph.D. in evolutionary virology and works in phage research in Montpellier, France. Clara is from Valencia and works in Reunion, an island close to Madagascar. She has recently identified new phages that kill the bacteria species responsible for “bacterial wilt”, one of the major plagues that affect tomato plants. 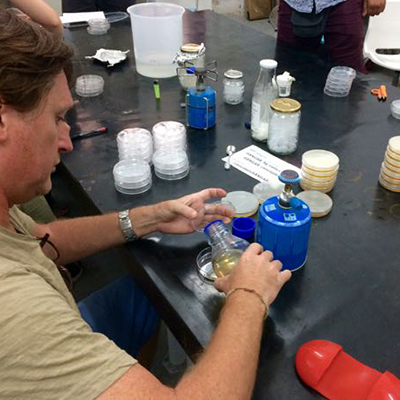 Wouldn´t it be great to use phages, harmless to human, instead of pesticides and antibiotics? Clara and Geronimo have created PhageFreeLab, an organization that wants to open bacteriophage research to citizen scientists and to health professionals. They want to support us to study and work with phages; discover and characterize new ones; try existing bacteriophage-based therapies; and develop new therapies. 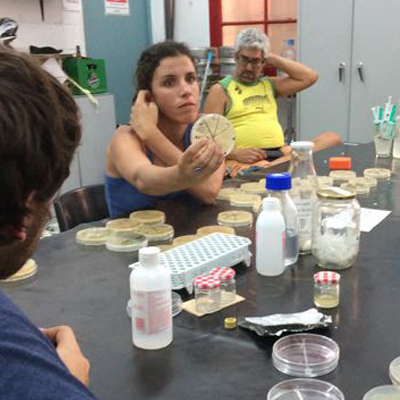 Geronimo describes their motivation with passion: “We want to create alternative models to the ones of the capitalist system, create spaces where it will be possible to investigate, develop and test the efficacy of bacteriophages against bacterial diseases using an open source model”. PhageFreeLab wants to “infect” society with the capacity to create a better world with the help of bacteriophages. Hey!! And what about the workshop results? Well, among other things we found phages present in the water that one of the participants brought from her cat feeder. Are these phages helping regulate the cat´s mouth and gut microbes?